If you're planning a holiday to the biggest isle in the Mediterranean then you're in luck, because we've selected six amazing things to do in Sicily - Italy holidays simply don't get better. This Italian gem is packed with pristine beaches, candy-coloured towns and medieval villages. Whether you're travelling with friends, family or a loved one, we have a variety of gorgeous, great-value hotels in Sicily to help plan your summer holidays. Get ready for swoon-tastic sights because Sicily has some of the most beautiful beaches in Europe. Golden sands, isolated coves, nature reserves and seaside resorts are all waiting to be discovered during your idyllic Italian escape. 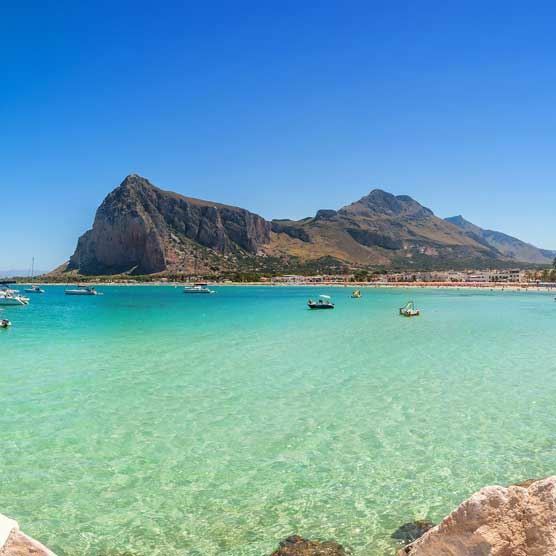 Check into lively Palermo, which has some the best of both city and beach vibes - Mondello beach is right in the city or Cefalo and San Vito Lo Capo, which are about an hour’s drive away. Bask in the sun on the long stretches of sand in Cefalo, one of the most picturesque towns in Sicily. To experience amazing sunsets, go up to Isola Bella in Taormina. A little distance from the coast lies Vulcano, where you can discover black volcanic sand beaches. There’s also the quiet Cala Mosche, the crescent-shaped Sant Vito Lo Capo, Marinello beach in the romantic town of Oliveri, and lots more! If you find yourself on the San Vito lo Capo beach in May, you may see the sky filled with colourful rice paper kites, ready for the week-long International Kite Festival. If spectacular Sicily has you seeking more, take a look at our must-see guide on where to go in Italy. Unlike its neighbour Vesuvius, Mount Etna is a volcano that’s very much alive and kicking, meaning experts constantly have their eye on it! Its last spectacular display was in 2005, and a holiday to Sicily isn’t complete without an all-terrain tour to its summit. The views from the top are out of this world. Grab your hiking boots as there are a number of tour groups you can join if you fancy climbing up the volcano and other lunar-like craters. Not close enough to the summit? Hop on board a cable car or funivia. Take the kids for a day of fun at Etnaland, a themepark and waterpark located at the foot of Mount Etna, with incredible water slides for kids, and rollercoasters that the entire family can enjoy! Sunshine-seekers must also visit beautiful Taormina, a hilltop town on the eastern coast of Etna that's fragrant with jasmine and bougainvillea even in winter - perfect for an idyllic weekend. There’s also an authentic ancient theatre, from where you can look out towards Mount Etna and the bay of Naxos. A little ahead lies Forza D’Argo, where the Godfather was filmed. Taormina has a glamorous side and attracts a sophisticated crowd who want to dig into authentic pasta and shop for designer labels after they’ve hit the beach. If you’re a foodie, drop in at the La Giara restaurant which offers a sweeping view of the coast from its rooftop and foot-tapping live music! Nearby Letojanni is slightly quieter but just as smart, while Cefalu in the north transforms from fishing village to major tourist hub every summer thanks to its amazing beach. Legend has it that hundreds of years ago wild Riserva Naturale Orientata dello Zingaro was home to smugglers, who hid their loot in the coves in the old days. The totally unspoilt Zingaro Reserve, set along the coastline with towering cliffs and isolated coves, boasts spectacular sunsets and crystal clear waters. There are loads of pebbly beaches where you can soak up the warm Mediterranean sun. Stroll along paths dotted with irises, orchids and wildflowers and you may even spot eagles and falcons overhead. You can grab a sandwich at the village of Scopello on your way into the reserve, too. In Sicily, it’s all about fabulous food and fruity wines. Combine both with wine-tasting and lunch at a vineyard or join a cooking course. Most resorts have good bars but the best nightlife is in the capital, Palermo. One of the island’s most famous dishes is aranci, delicious deep-fried rice-filled balls of yumminess. Catania, Sicily’s second largest city, serves up some delicious Pasta alla Norma, made with fried aubergine and ricotta cheese. Sicily takes its food seriously and it’s no wonder that most villages have unique festivals - Bronte’s Sagra del Pistacchio or Pistachio festival in October, Vizzini’s festival of ricotta cheese in April, besides a week-long cous cous cook-off in San Vito Lo Capo in September, among several others. If you have the time, make a trip to the Aeolian archipelago, to the north of Sicily. Start with the lively port of Lipari and go island hopping to the smaller islands of Vulcano, Salina, Panarea, Stromboli, Filicudi and Alicudi, all unspoilt and with great beaches. In Vulcano, you get to experience a natural jacuzzi with thermal waters that spring through rocks near the beach. In Stromboli, you can spot flowing lava and, if you want to get away from it all, sunbathe four hours on the peaceful beach of Alicudi.